The Center for Global and Regional Environmental Research has produced an informational video series focused on highlighting the research of University of Iowa graduate students and faculty members. 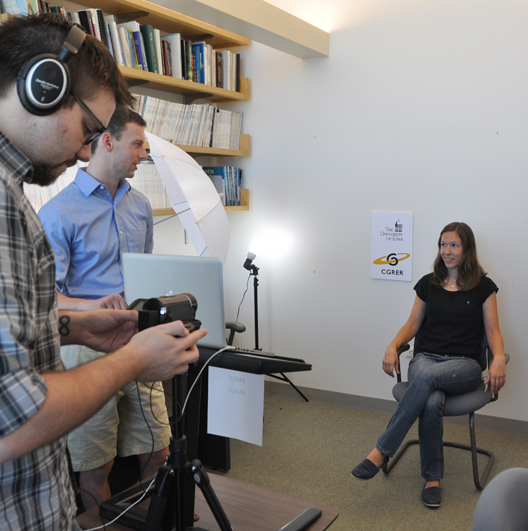 A CGRER Research Focus video shoot. The CGRER Research Focus video series offers a uniquely personal view into the exciting and valuable research being done at the University of Iowa. Each video aims to break down the often complex and confusing subject matter of these research topics into simple and approachable terms for a general audience. 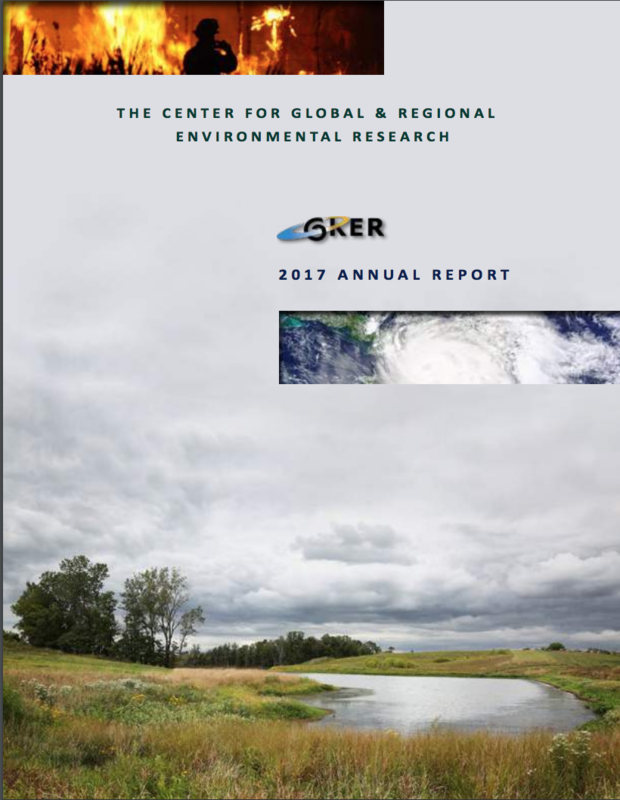 If you have any questions, or would like to learn more about the CGRER Research Focus video series, please email us at iowaenvironmentalfocus@uiowa.edu. Kajsa Dalrymple, an assistant professor in the University of Iowa’s School of Journalism and Mass Communication, explains her research on communicating with the public about water sustainability issues. Dalrymple is one of ten new faculty members hired at the University of Iowa as part of their Water Sustainability Initiative. 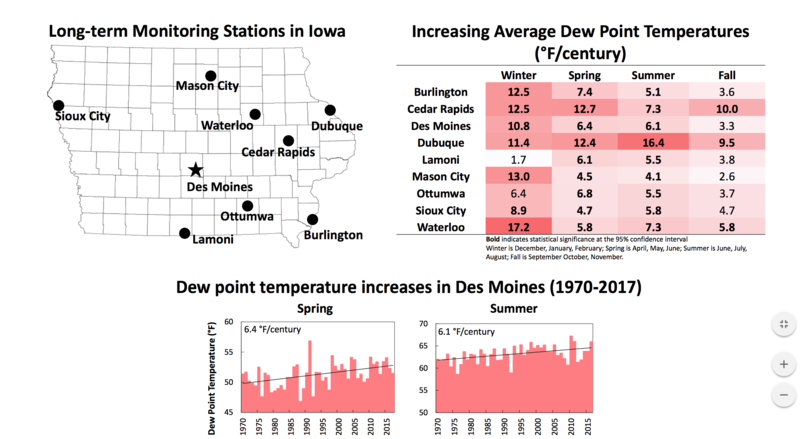 Caroline Davis, a post doctoral student in the University of Iowa’s IIHR Hydroscience & Engineering Department describes her research on water quality at Lake Odessa, Iowa. Amir Farnoud, a PhD Student in the Chemical and Biochemical Engineering Department at the University of Iowa, discusses his research on surfactants. Tori Forbes, an assistant professor in the University of Iowa’s Department of Chemistry, explains her research on the impact of uranium in environmental systems. Forbes is one of ten new faculty members hired at the University of Iowa as part of their Water Sustainability Initiative. Seyed Hajimirzaie, a PhD student in the University of Iowa’s Civil and Environmental Engineering Department, discusses how knowledge of water flow patterns around mussels not only helps mussel populations, but can also be applied to a variety of other situations involving both water and air flow. Brittany Huhmann, a graduate research assistant in the University of Iowa’s Civil and Environmental Engineering department, details her research on how arsenic gets released in groundwater. Craig Just, an assistant professor in the University of Iowa’s Department of Civil and Environmental Engineering, explains his research on how mussels process nitrogen. This research will help Just quantify the impact mussels have on filtering nitrogen that enters the Mississippi River from Iowa, which ultimately causes a dead zone in the Gulf of Mexico. Just is one of ten new faculty members hired at the University of Iowa as part of their Water Sustainability Initiative. Hans-Joachim Lehmler, an associate professor in the University of Iowa’s Department of Occupational & Environmental Health, explains his research on how different organisms process the toxic compounds PCBs. Lehmler is one of ten new faculty members hired at the University of Iowa as part of their Water Sustainability Initiative. Rachel Marek, a graduate research assistant in the Civil and Environmental Engineering Department at the University of Iowa, discusses her research on PCBs. Pallavi Marrapu, a research assistant in the University of Iowa’s Chemical and Biochemical Engineering department, discusses her work forecasting air quality in Delhi. Nicholas Petrich, a graduate student in the University of Iowa’s Environmental Engineering department, discusses his research on determining concentrations of PCBs in the air. Pablo Saide, a research assistant at the University of Iowa, explains how he uses existing information about the properties of clouds to help satellites determine the amount and types of aerosols beneath clouds. Pablo Saide, a research assistant in the University of Iowa’s Environmental Engineering department, discusses his completed research modeling air quality in Santiago, Chile. Jon Scholte, a graduate research assistant at the University of Iowa, explains how he uses photopolymerization to create materials with different properties. Luke Smith, a senior in the Department of Civil and Environmental Engineering at the University of Iowa, details his research on an ecosystem’s ability to naturally clean oil through a process called phytoremediation. Betsy Stone, and assistant professor in the University of Iowa’s Chemistry department, discusses her research tracking air pollution in Iowa City. Ali Varmaghani, a PhD Student in the University of Iowa’s Civil and Environmental Engineering Department, discusses his research on modeling evaporation. Adam Ward, a former assistant professor in the University of Iowa’s Department of Geoscience, explains his research on the transport of water and what it carries through the landscape. Ward is one of ten new faculty members hired at the University of Iowa as part of their Water Sustainability Initiative. Samantha Westerhof, a senior in the Department of Chemical Engineering at the University of Iowa, discusses her research on using phytoremediation to extract harmful particles from the environment.